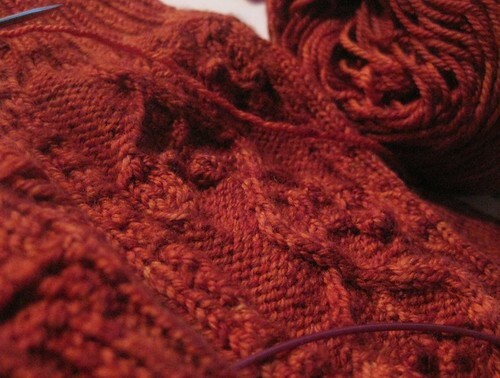 As 2010 winds down I’m happy to be finishing up a couple (if not all) of the projects currently on the needles. I got my Elizabeth Zimmerman fair isle yoke sweater finished a few days ago (will happily do a finished object post about that next time), and now that my bit of gift knitting is done I’m also finishing up the last of the 3 patterns for a collection of mittens and gloves I’ve been working on with Indigodragonfly yarns. Because these are inspired as a generally gothic collection taking after characters from the Buffy the Vampire series, Kim has been delighting in naming a series of colourways according to characters and quotations. This one is for Willow, and is so named ‘My world is askew,’ but she’s got others in the mix for several characters. I’m hanging at her place for the rest of 2010 and it’s a relaxing time so far, featuring knitting, sitting, and co-hosting by Otis the dog. 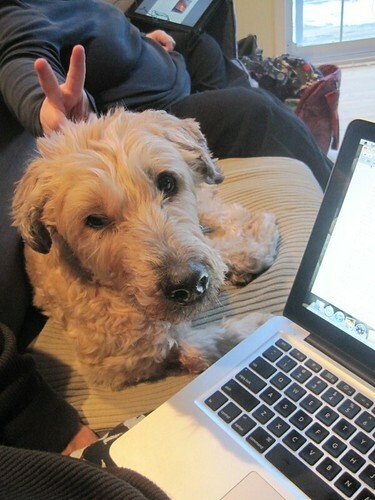 He is terribly stressed out, as you can see. I hope your last knits for 2010 are enjoyable ones! I am looking forward to exciting new knits in 2011. Can’t wait to see all the new patterns! wow i feared you were closing out the forum and newsletter ! my poor heart ! i did buy Vampire Knits, which arrived today. yay for the inclusion of a few ‘werewolvian’ items (i looked up the word). Can’t wait for the patterns. I’m sure they will be as beautiful as the yarns. Happy New Year, Glenna. Can’t wait to see all the finished object pictures from the Buffy series. 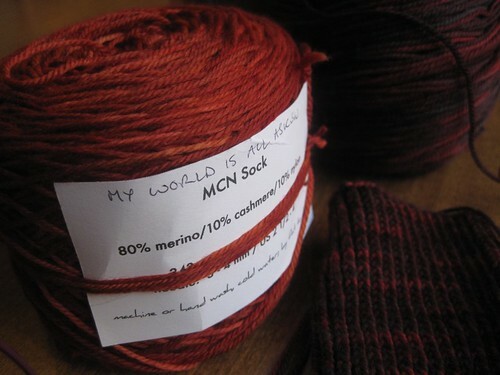 The yarn names are *very* tempting! Sending you all sorts of luck for the coming year, from the frozen *south*. So very, very glad I stumbled onto this blog. That vampire color askew is amazing. I hope the colorway is exactly the shade I see on my computer screen! So pretty! I love the cozy red cables — can’t wait to see the full pattern collection.